Sotheby's, London, 1 May 1958, lot 60 (76 gns.). Christie's, London, 17 October 1995, lot 19. This miniature characterises Hilliard's innovations circa 1593/94 with the introduction of a background in the form of a folded velvet curtain in the wet-in-wet technique instead of the usual blue bice background. 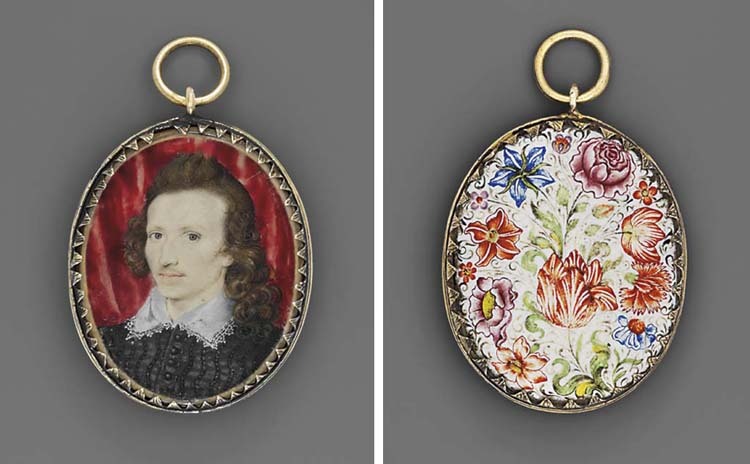 The earliest dated example of the folded curtain is the miniature of Henry Wriothesley, 3rd Earl of Southampton, dated 1594, in the Victoria and Albert Museum where the sitter favours the fashionable style of wearing the hair long on the side of the face as in this miniature.